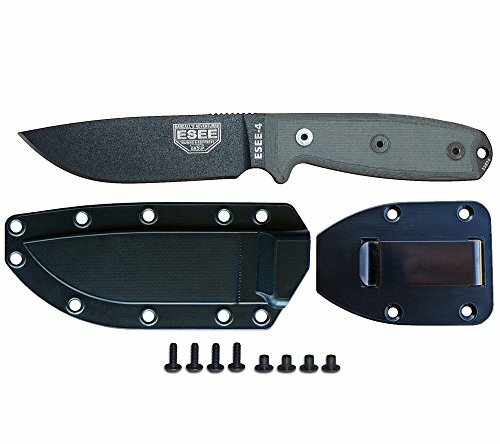 If you've never owned an ESEE Knife before, the Model 4 is a great introduction. Made in the United States of 1095 carbon steel and finished with a non-reflective black powdercoat, this is one of the most popular ESEE Knives on the market. Built to withstand hard use in rugged environments, the Model 4 is a favorite of US Service Members serving in Afghanistan and elsewhere. In 2014, ESEE Knives introduced molded polypropylene sheaths for the Model 4 knife. This move is based on feedback from troops in Afghanistan, who reported that some kydex sheaths were cracking in cold weather environments. Excellent full-tang hunting and survival knife made from American 1095 high carbon steel. Black epoxy powder-coated blade for weather resistance; Linen Micarta handle scales for comfortable extended use. Molded Polypro Ambidextrous Sheath with strong retention protects the blade and allows for belt, boot, neck, or pack carry; Included belt clip plate for regular carry; Included lanyard and cord lok can be used to set up horizontal scout-style carry. Made in the United States by Rowen Manufacturing for the survival and SAR staff at Randall's Adventure and Training/ESEE Knives. Berry Amendment Compliant.